Companion pets in the form of puppies, young adults, and more mature individuals who have been retired are sometimes available to good homes. Bringing a new pet into your home is a big decision and a long term commitment. Please think carefully about your decision to acquire a new family member. A few former Topsfield pets are pictured here. Their ages, personalities and looks vary. We try to match our pets with the appropriate family and home. It is important that we know what your expectations are and what type of family and home situation you have. Their needs vary, and some would prefer homes with children, some would prefer a more quiet atmosphere, some an active lifestyle, and some would simply like to be snuggled. The Topsfield puppies, young adults and retirees pictured on this page are a few of those who found the perfect home! They are well loved and cared for and exemplify the fact that they are important members of their families. Pictured right are photos of the first year of "Boone's" life as a companion pet with his new family. Boone is typical of the many companion pets that Topsfield has placed in loving homes. We will be happy to answer email questions, but require that we speak with you personally regarding the availability or placement of any hound. We have a fillable form available below, please fill and return by email to domorlan@gmavt.net. We require that all pets must be spayed or neutered. What Age Basset is Right for My Family? No doubt puppies are cute, but they require a lot of time and attention in their first months in a new home. Topsfield puppies are not available until they are ten to twelve weeks of age, and sometimes much later. Housebreaking and training a puppy requires a lot of time and dedication. All puppies are curious and busy, and must be well supervised. Young adults or more mature Bassets are a wonderful choice for many families. They are further along in their training, and generally settle into their new homes with ease. Most of our young adults or more mature dogs have traveled with us for shows, so are crate trained, and are able to adjust quickly into their new home. For busy or working moms and dads, or more mature people, young adult Bassets and more mature Hounds are a very wise and rewarding choice. Either young or more mature, Basset Hounds are a wonderful breed and a joy to live with. Choosing the right breeder to work with is an important decision. 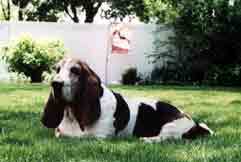 We suggest that you visit the Discover the Basset Hound section of the website. It gives you valuable information regarding bringing a new Basset into your life. Bringing a pet into your family is a long term commitment. If you are interested in owning a Basset Hound, we suggest you explore the website, especially, "Discover the Basset Hound" to see if a Basset is the right dog for you. After that, please contact us and we will do our best to help you. A click on the red type will take you there. The Basset Hound Owners Guide is designed for anyone who has purchased a Basset Hound or is contemplating doing so. The owner's guide provides valuable information and answers many questions about the training, grooming and health of the Basset Hound. The Basset Hound Coloring and Activities Book is designed to teach children how to care for their Basset. It is appropriate for children who like to play with colored pencils & crayons. It features lessons regarding the care and safe keeping of your Basset Hound. The Basset Hound in these eight photos is named "Otto". The photos are courtesy of his human mom, Betsy Delonti. Thanks so much for giving "Otto" such a great home!